Last week the National Oceanic and Atmospheric Administration “NOAA” issued a new 44-page report, “Global and Regional Sea Level Rise Scenarios for the United States.” They have created a new projection line for as much as 8.2 feet (2.5 meters) by 2100, the red colored line shown above, based upon a comprehensive assessment of the latest science primarily focused on Greenland and Antarctica. Eight feet of higher sustained sea level will be catastrophic for almost every coastal community in the world. To slow rising sea level and the other effects of climate change, we must reduce greenhouse gases as quickly as possible. However, regardless of the fact that we can slow the rise, we can not stop it in the coming decades. The ice melting and the sea rising have passed a “tipping point” and will continue for centuries. We must begin planning and adapting to higher sea level NOW! That would be the smart thing to do recognizing the new record flooding in coastal areas, as a result of more severe storms, record rainfall, and extreme high tides, all compounded by rising oceans. A few places are beginning the process to look at how to adapt to higher sea level — in fact there are dozens of communities around the US and globally that are starting to take this huge challenge quite seriously. This new NOAA Report and the 8 foot red line should add urgency to begin the process and to think ahead — so that our investments in buildings and infrastructure are truly good investments, ones that will protect us today and be a good foundation for communities of the future. “By 2050, this will be normal,” said Aldaron Laird, standing near the top of an Arcata wastewater treatment pond levee as waves broke at his feet. A small group had trekked out to the Rising Tides Bench during a nine-foot King Tide on Dec. 13 for a discussion of sea level rise, its imminence and consequences. While the bay’s present borders can more or less withstand today’s King Tides – also known as perigean spring tides, which coincide with maximum gravitational pull by the moon and sun – that won’t be the case when they ride in on top of tomorrow’s raised sea levels. 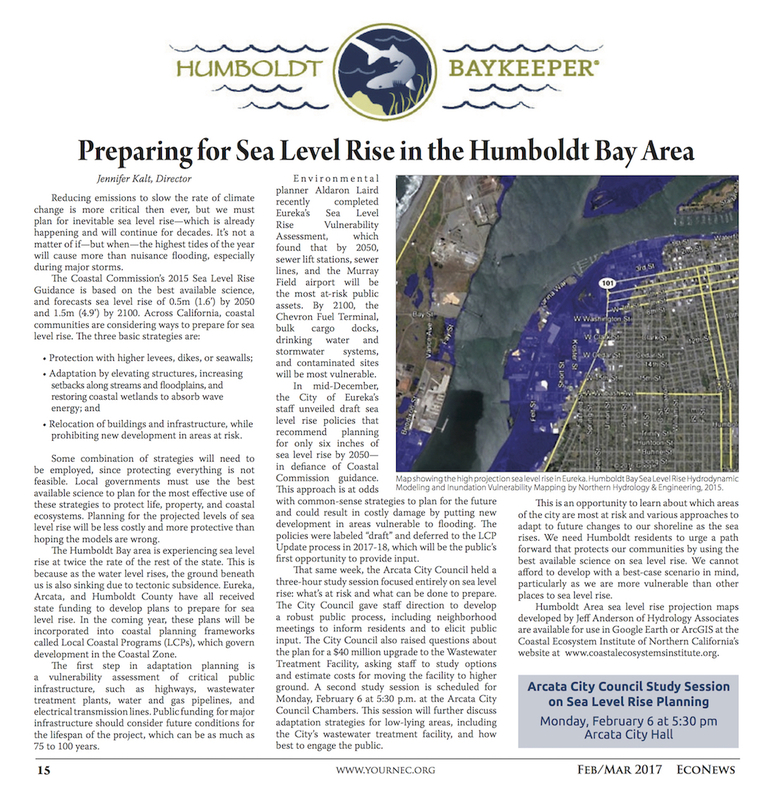 At that point, seawater would overtop current levees and inundate coastal areas, including homes, farms, businesses and critical public infrastructure. The higher sea levels are not an “if,” they’re a “when.” What we don’t know is exactly when.